The Bernese Mountain Dog Poodle mix, often referred to as a Bernedoodle or the Bernese Mountain Poo, is a mix made up of the Standard Poodle and the Bernese Mountain Dog, although in some cases the Miniature Poodle or Toy Poodle may be used as well, creating the Mini Bernedoodle and Tiny Bernedoodle respectively. With a blend of the placid nature and loyalty of a Bernese and the fun intelligence of the poodle, this hybrid can be a great pet. If you’re considering the Bernese Mountain Dog Poodle mix for your family, here’s a look at some helpful information that will enable you to make the right choice. Although no one knows exactly when the first Bernese Mountain Dog Poodle mix was bred, they have become quite popular within the past 10-15 years. It’s thought that the hybrid may have been first intentionally bred in Canada. While we don’t know a lot about the hybrid’s origins, we can learn more about these dogs by taking a closer look at the history of the parents. The Bernese Mountain Dog originated in the Swiss Alps and was bred to be a farm dog, helping with pulling carts or helping get cattle to market. Since they lived in the mountains, they were bred to easily deal with the cold weather, and it’s thought that the breed has been around for more than 2,000 years. These dogs are easy going and very loyal, and they’re great with families and other pets. Originally, the Poodle was from Germany, and these dogs were initially bred to help with hunting waterfowl. This breed is very old, and through the years, three different sizes have been bred, including the standard size, toy size, and miniature size. Today these dogs are known for their intelligence, and many people with allergies turn to Poodles because they are known as being hypoallergenic. 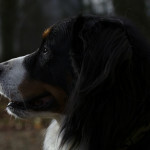 The standard size Bernese Mountain Dog Poodle mix is quite large, usually standing between 23 and 29 inches tall and weighing between 70 and 90 pounds. The Mini Bernedoodle in turn stands between 18 and 22 inches tall and weighs between 25 and 49 pounds, while the Tiny Bernedoodle measures between 12 and 17 inches tall with a weight between 10 and 24 pounds. These dogs come in a variety of colors, including the tri-color look of the Bernese. However, some may have various mixtures of black, white, and brown, depending on the parents. In most cases, the hybrid’s coat has more of the Bernese colors while the coat type is more like that of a poodle. While every dog will have a coat that is a bit different, most of them have a wavy coat that sheds very minimally. You’ll find the Bernese Mountain Dog Poodle mix to be loyal, playful, and very friendly. They usually have both the intelligence of Poodles, as well as that fun goofiness that make them so hilarious to be around. These dogs usually love playing games and getting into a bit of mischief. Since they are enthusiastic, curious, and full of energy, they’re plenty of fun for an active family. The Bernedoodle hybrid is generally very cuddly and loving with family members, but they may be a bit cautious when around strangers. It’s important to socialize and train these dogs while they are very young to make sure that cautiousness doesn’t end up turning into skittishness. When these dogs are young, they are often headstrong, so when training these puppies, you’ll need to be very persistent and consistent with training. Since these dogs do have a lot of energy, you need to make sure that your Bernese Mountain Dog Poodle mix gets plenty of exercise each day, especially larger dogs. They love hiking, running, swimming, or just playing out in the back yard with their family. Playtime and a daily long walk is important, but some time at a dog park is great too. Usually the Bernese Mountain Dog Poodle mix has a coat that is low shedding or non shedding, so you don’t have to worry about a lot of hair on your clothing, furniture, or around your home. However, if the dog has a curly coat that’s more like a Poodle’s, then your dog will need regularly clippings done by a professional groomer every few months. Even if your Bernedoodle has a wavy coat, they’ll probably only need to be brushed once or twice a week to prevent any matting or tangling. These dogs only need to be bathed as needed, and nails should be done as needed as well. Be sure to check the dog’s eyes and ears for infection, and ears should be wiped out weekly. Although both of the parent breeds were used in working roles, the Bernese Mountain Dog Poodle mix generally is not used in working roles today, but they do make wonderful family pets. Usually the Standard Poodle lives to be between 10 and 15 years old, while the Bernese Mountain Dog has an average lifespan of between 8 and 11 years. You can expect your Bernese Mountain Dog Poodle mix to have an average life expectancy of somewhere between 8 and 15 years, with the Mini Bernedoodle and Tiny Bernedoodle living the longest. Thanks for discussing the Bernedoodle in detail! It’s interesting to learn that there are three sizes of Bernedoodle the other a quite large one while the mini is around 18 to 22 inches tall and tiny is at 12 to 17 inches. I think I would love to have one of these, specifically the tiny one. I’ll talk about the tiny Bernedoodle with my wife and see if she’d approve. It had been awhile since we last had a dog to take care of.